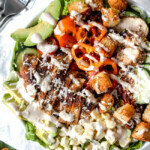 Chicken Caesar Salad bursting with not only Parmesan cheese and homemade croutons but crispy bacon, fresh corn, avocados, tomatoes, cucumbers etc. and the most tender, juicy Lemon Basil Chicken all bathed in luscious WAY-better-than-store-bought Caesar Dressing. Lemon Basil Chicken: Prepare according to directions. Set aside. Caesar Dressing: Add all of the dressing ingredients to your blender EXCEPT the Parmesan and chop then liquefy until smooth, scraping down sides as needed. Add Parmesan and puree until smooth. Taste and add salt/pepper to taste if needed and additional lemon juice if desired. Chill while you prepare the remaining ingredients. Croutons: Preheat oven to 400F degrees. Cube bread into bite size pieces and add to a large bowl. Drizzle with olive oil and toss to coat. Spread bread in an even layer onto baking sheet and bake for approximately 15 minutes or until golden. Assemble: Add all of the Salad Ingredients to a large bowl and toss to combine (if you are expecting leftovers then hold avocados and add to individual servings). You can add more of whatever ingredients you love (measurements are just guidelines – I like to add more corn). If not expecting leftovers, drizzle salad with desired amount of dressing and toss to combine along with freshly grated Parmesan. Garnish with bacon, croutons and top with chicken. If you are expecting leftovers, garnish individual servings with dressing, bacon, croutons and chicken. *found in cans next to the tuna fish – don’t be grossed out – they MAKE the dressing! **I use a French bread called “Everything French Bread” that has sesame seeds, poppy seeds, garlic and herbs already baked into it. If your bakery has something similar I highly suggest it! If they only have garlic or herb French bread, then use that. There will probably be extra croutons – store in an airtight container or plastic bag. No matter how you cook your chicken, you’ll want to devour its lemon basil goodness in every bite. Move over croutons.